Strouse is one of the most accurate converters for precision die cutting. Combine those capabilities with custom printed tape and we can create parts and labels that fit seamlessly with your process and product design. Our customers use our printing services for both internal use and as components to their products. Whether it’s your logo, product instructions, or labeling we can laminate and print on materials and provide them in a format that fits your assembly process. 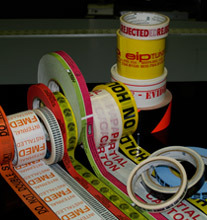 Our customers use custom printed tape to help consumers understand how to use their products. Some products, to be used properly, require a certain process to be followed. Liners may need to be removed in a specific order and we can print on these liners to help consumers identify what steps are next in the process. Printing critical information on a label is important for some products but the label must fit properly on the packaging or the product. Strouse has mastered die cut printing to create custom shaped identification labels, tamper proof labels, and printed process instructions placed on consumer products. These tapes can be die cut to custom size and shape for your application. 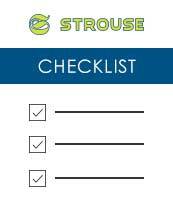 Strouse provides custom printed tape to customers in many different formats. Products can be supplied as a roll of tape, parts die cut on a roll with the waste removed, sheeted parts, or as individual pieces. If you are sticking to a difficult substrate or need a label to withstand special conditions our engineers can perform testing to find the best material for your application. Contact us today if you’d like to learn more about our die cut printing services.